A Massachusetts behavioral health facility is facing $208,000 in proposed OSHA penalties for violations found while conducting a follow-up inspection. On June 29, the agency issued the hospital a notification for failure to abate workplace violence risks. The action follows a serious violation related to the same hazards found in 2015. As a result of that inspection, the employer and OSHA entered into a formal settlement agreement. It outlined specific provisions of a workplace violence-prevention program. OSHA initiated a follow-up inspection in January of this year after the facility failed to provide documentation showing that it had implemented a workplace violence program. What’s more, an OSHSA area office received a complaint alleging employees remained at risk. OSHA determined that the center had failed to comply with terms of the agreement and that, despite previous citations and worker injuries, the risks for injury or death still existed. The site is part of a large health-care management company that operators 350 behavior health facilities, as well as acute care hospitals, ambulatory centers, and freestanding emergency departments. According to OSHA, healthcare workers are at increased risk of violence. During an 11-year period, incidents of serious workplace violence—those requiring days off for recuperation—were four times more common in healthcare than in private industry. 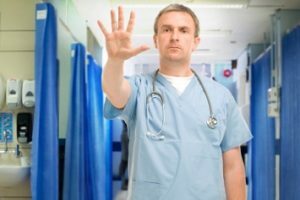 While patients are the largest source of violence in healthcare workplaces, they are not the only source. Incidents are also caused by visitors, workers, and others.